This chapter tells the story of office-to-residential change of use in Leicester. 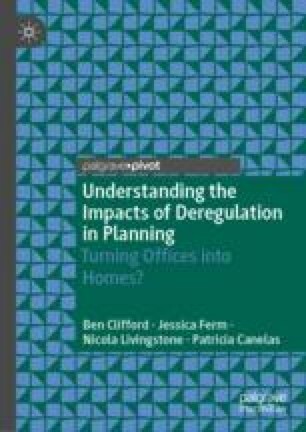 This chapter considers the specific issues seen in Leicester, contrasting the positive reuse of redundant/vacant office space with concerns over residential quality and an overall lowering of standards (particularly in the private rental sector [PRS]). These issues surrounding the quality of housing delivered and their wider impacts for the local economy will be highlighted throughout the chapter. The focus is the particular ways that central government-driven deregulation has had impacts in Leicester. Allsop. (2016). Lot 63: Leicester, Allied Place, 44 Abbey Street. http://www.auction.co.uk/residential/data/full_text/july2016/pos63.pdf. Accessed 7 October 2017. Leicester City Council. (2017). Leicester’s Planning Database. http://rcweb.leicester.gov.uk/planning/onlinequery/mainsearch.aspx. Accessed 7 October 2017. NOMIS. (2017). Official Labour Market Statistics. https://www.nomisweb.co.uk/census/2011/ks101ew. Accessed 1 November 2017.